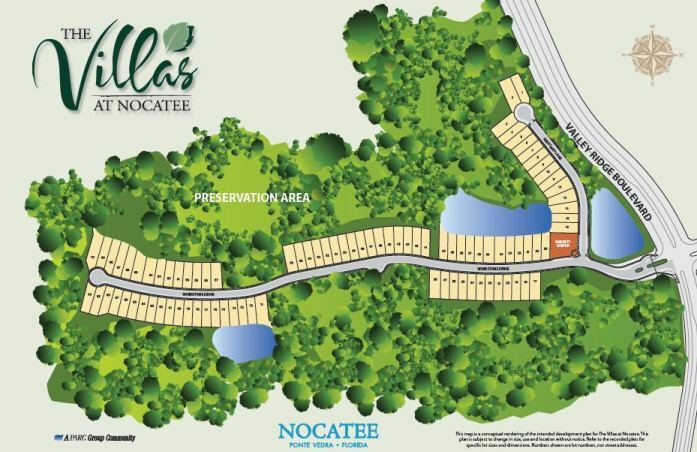 Set to debut this fall, The Villas at Nocatee will be a CalAtlatnic Homes gated community that features its very own pool and amenities. Residents will also have access to Nocatee’s full complement of amenities, including Splash Water Park, fitness center, walking trails and more. Paired villas will share a connected wall and range from 1,900 to 3,300 square feet. These villas will be 1-story and have 2-3 bedrooms, 2 baths, den and 2-car garages. For those looking for even more room, an optional second floor can be added for a bonus room or additional bedroom and bath. All ninety homes will back up to preserve or water, allowing homeowners to fully enjoy the beauty of the surrounding nature. New homes will be offered in a variety of elevations, including Spanish, European Cottage and Italianate. These fresh and innovative plans will reflect CalAtlantic's tremendous dedication to quality through fine craftsmanship, premier materials and an attention to the most thoughtful details. Other exciting features include the natural lighting that these home plans allow, perfect for those entertaining both outside and indoors. Fully equipped with cutting edge technology capabilities, residents will enjoy the upgrades and options available to them. New homes will begin in the low $300s, and appeal to a wide range of buyers. As a maintenance free community, these homes will be especially popular with those who desire a carefree lifestyle that a luxury villa affords. CalAtlantic expects model homes to be completed by late Fall 2014. To learn more about this new community, contact CalAtlantic or visit the Nocatee Welcome Center.